If I had known what I knew now when I was starting my own business, I would probably do a lot of things differently. Oh, hindsight. But the reality is, I learned so much. Aside from the potpourri stand that Alyse and I started when we were about 7 years old, I actually started my first real business when I was in high school. I taught swim lessons and lifeguarded at our city pool for all of my high school and some of my college summers. And it was a great job – a job that I truly loved – I got paid to play with kids, teach and be outside all day. But I was working a lot of hours for little pay and I wanted to make more money. One even, while talking to some parents after my last swim lesson, I heard one of them say hat they were having a hard time getting their kids to the pool in time for lessons (because of work schedules) and that they wished they could hire an instructor to come to their pool and teach their kids on their watch. So I did just that. I started teaching a few kids after work, and then a few more and pretty soon, all the neighborhood kids. And let’s just say, it was great money! It was so good, in fact, that I didn’t mind working the extra hours after my full day at the city pool. They always say the first business is supposed to be the hardest one but for me, the real challenges began when I started my second business. My second business is the one that taught me about rejection, failure, passion, and hard work. On more than one occasion I can remember panicking that our bank account had hit zero, or walking out of meeting feeling rejected, or giving everything and more to someone, an idea, a project and having it completely flop and fail. And while it would be awesome to go back and do it all over again, I realize that it also taught me some of the most valuable business lessons I’ve learned. 1. Have thick skin. People are going to tell you that your ideas are stupid and that you’re going to fail. You have to be open to feedback but you also have to stick to your guns and stay true to what you believe. You have to have a thick skin. True story: Alyse and I took a “friend” out to dinner for business advice and over the course of dinner this “friend” criticized us, made us feel small and then stormed out of the restaurant in the middle of dinner because we wouldn’t accept what was being said. 2. Trust yourself. You should always listen to others. Be an open ear. Take in feedback and even criticisms but don’t ever discount your gut instincts. You started this business because its your passion, your baby, your everything – you know it better than anyone else – always trust your gut. True story: after sitting through a rather painful meeting full of criticism, rejection and negativity, Alyse and I walked straight into a wine bar and toasted a glass to our future successes. We never lost trust in ourselves. 3.Be a connector. Don’t ever underestimate the power of your network. Always offer your help to others and make connections whenever possible, even when there is nothing in it for you. Always help others shine! True story: we started our entire business on building connections and helping others shine. We always help others – with little or no return – and know that making connections will help us be successful. It’s all about the long game, people. 4. Be passionate. Never forget why you started your business in the first place. Even when you make mistakes and the going gets tough, you can’t lose that passion. Without passion, your business will not succeed. True story: In our first year of business, Alyse and I knew that a lot of the Sweat Pink community would be running the Nike Women’s Marathon and that we had to be there in some big way to connect with them. We hauled giant, heavy bags full of tank tops, shoelaces and other fun things downtown San Francisco and set up a little Sweat Pink “stand” outside the Nike Women’s Marathon Expo. We eventually got asked to leave and so we hauled all of our stuff and our line of people to the other side of the street and continued on spreading the good word (and of course some fun swag). Gotta have that hustle and that passion! 6. Know when to pay & when to do it yourself. There are so many things you’ll need that you won’t even know you need when you first start a business. For instance, dealing with insurance, legal things, marketing, public relations or even taxes. Figure out what things you can do yourself and what things you should pay to have someone else do for you. True story: when we first started our business, we didn’t want to “pay” to have our taxes done. And up until about a year ago, we were still paying for that mistake. We went the cheapest route possible to have our taxes done – and they were done – only incorrectly. It took years, a really awesome accountant and some money to make things straight again. Lesson learned! 7. Be flexible. You have to be willing to take risks and change things that aren’t working. As an entrepreneur you have to be adaptable and flexible to keep growing and evolving your business. True story: in our first year of business, we were losing a LOT of money on a marketing initiative that I really loved. It was my thought baby. It was genius (at least to me)…but it was also expensive. With help from my very practical business partner, we changed course, adapted our plan and moved forward to more successful and sustainable model. 8. Know that not everyone is going to like what you’re selling. There are always going to be people who will complain or have a problem about something you’re doing. You need to realize that you can’t please everyone (nor should you try) and that those people just aren’t worth your time. Focus on people who make your business better and help you grow. True story: we have had so many instances where people have complained or demanded something different from us. And while we love feedback, there have been times when the demands or complaints were about things we either didn’t stand for, didn’t value or didn’t agree with and we just had to move on. 9. Know the good apples from the rotten ones. I wish I could say that everyone I’ve ever hired has been a good apple – someone who is as committed to the vision, wants to work hard and be worth their keep – but unfortunately I can’t say that. The truth is, hiring for a small business is hard. You have less time, not to mention less people to help filter who you bring on your team. The trick is to identify a rotten apple quickly and then act swiftly – meaning not hiring or even firing them. True story: let’s just say that we’ve come across a few rotten apples over the years – the people who take advantage, don’t do the work, don’t respect us or the vision or are just plain out rude – and we haven’t always acted as quickly (or trusted our gut) as often as we should have. This has been a big lesson learned for me: if you hire a rotten apple, get rid of them quickly. If you hire a good apple, do what you can to keep them happy! 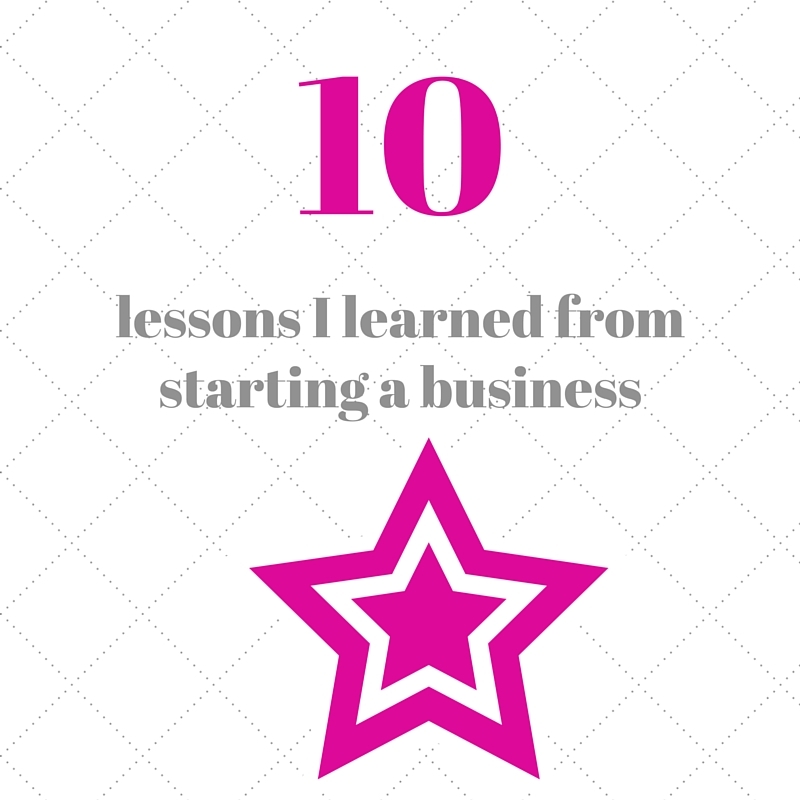 What are some of the biggest lessons y’all have learned from starting a business? And as always, stay sweaty my friends! My 5 favorite things about Mighty Nut Peanut Butter & a GIVEAWAY! Jen – I’m ALWAYS happy to give advice on this stuff – seriously, you can email me, comment, Insta me, whatever. This is a topic that I love and feel strongly about and am always willing to help others succeed. 🙂 I wouldn’t have a business if it weren’t for others be willing to help me. Such a great post. Being an entrepreneur is very hard and has many ups and downs. We own our own family business and there is definitely some bad that goes along with the good but you just have to keep pushing on and moving forward. You two are truly inspiring! Congratulations!!!! awww, thanks Sandra! It’s one of the hardest (and most rewarding) things I’ve ever done! I love sharing the real stuff with my fellow entrepreneurs — makes us feel less alone! You forgot courage! You and Alyse are so brave and that is what sets you apart! My heroes! This is great, Jamie! So many valuable and relatable lessons in there. I think for me, one thing that’s been important has been trying to remember the joy of why I got into doing what I’m doing when the passion melts away. I feel like it’s natural for passion (or the fire for your work) to ebb and flow with the everyday realities of life. But it’s been important for me to not get stuck in that negative mindset when it wanes. Instead, I just recenter (usually by meditating!) and then get back at it, paying special attention to those moments of joy in the work. Absolutely love this, Jamie. I was having a tough day being a #girlboss yesterday and this is just the encouragement and honesty that I needed. I’m SO glad to hear that, Jen, now go and get your #girlboss on! First off, I am cyber hugging you out of the blue with a little extra shake and squeeze at the end! AWWW, Carleeh, so much love, we love you – and all your Sweat Pink amazingness! I loved reading this! You are far braver than I. My boyfriend and I are currently running our own business. It’s a franchise though, so far less stressful than creating your own!